Two Thanksgivings ago I was making a turkey breast in the crockpot that called for the cranberry sauce. 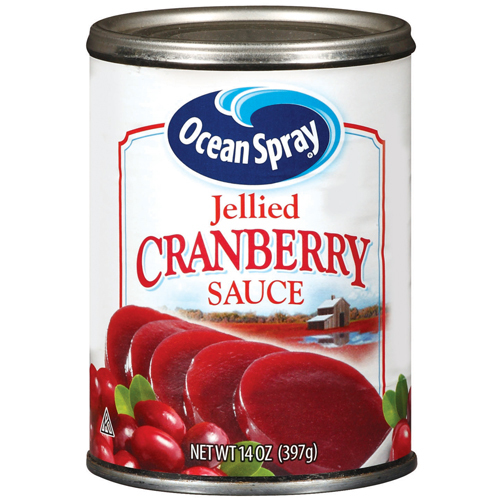 [You can see that holiday post with the featured recipe here] On that particular shopping trip I purchased two cans of the cranberry sauce since I know it's his favorite. And like any canned good it got shuffled to the back of the pantry and made the move to the new house. So it had been taunting me for a little while. Recently I was "decluttering" for a community yard sale and was going through cookbooks. There was one that I hadn't used in awhile but didn't quite want to give it away because it has lots of good, quick dinner options that weren't complicated to make - the Better Homes & Gardens Big Book of 30-Minute Dinners. I flipped through it to confirm whether or not I wanted to keep it and a honey cranberry chicken recipe just popped out at me! 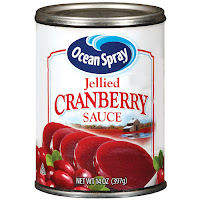 It was a sign and I immediately thought of the lone cranberry sauce still hanging out in the pantry. After telling Patrick how we came to be eating this meal over dinner he simply replied "well why didn't you tell me it was in the pantry, I would've eaten it!" That may have been the case but I really liked trying it in this sauce! We paired the chicken with black rice and asparagus. Rinse chicken; pat dry. In a large skillet cook chicken in hot butter over medium heat about 10 minutes or until chicken is tender and no longer pink, turning once. 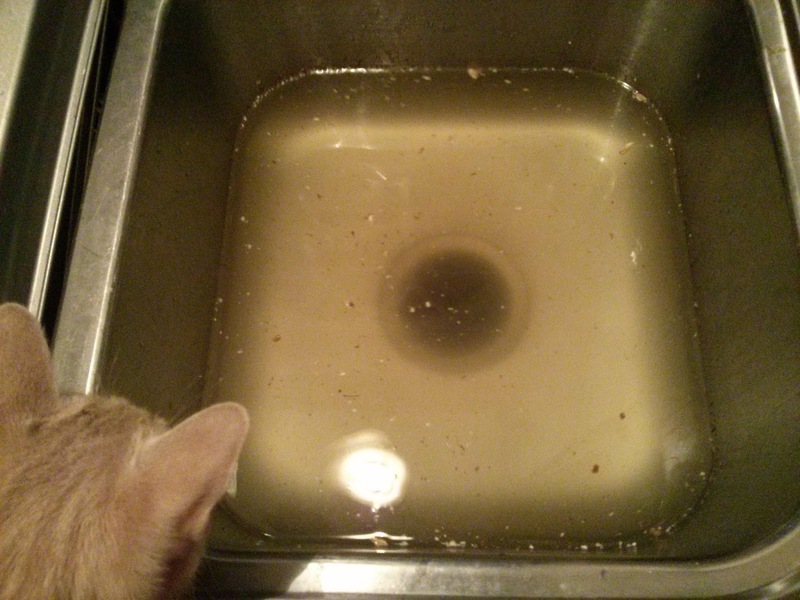 Remove chicken from skillet, reserving drippings in skillet. Keep warm. Stir cranberry sauce, honey, and ginger into the reserved drippings in the skillet. Cook and stir until heated through. Spoon over chicken. Note - I used 3 large chicken breasts. This they were thicker I seared each side in the skillet for about five minutes each and then placed them into the oven were the asparagus was roasting at 375F. Hello, Patrick here filling in on Meal Plan Monday. Whitney and I had a very busy and productive weekend with a community yard sale on Saturday, and then spending most of Sunday in the yard clearing out brush and dead trees. I guess we were so tired at the end that we forgot about the blog! 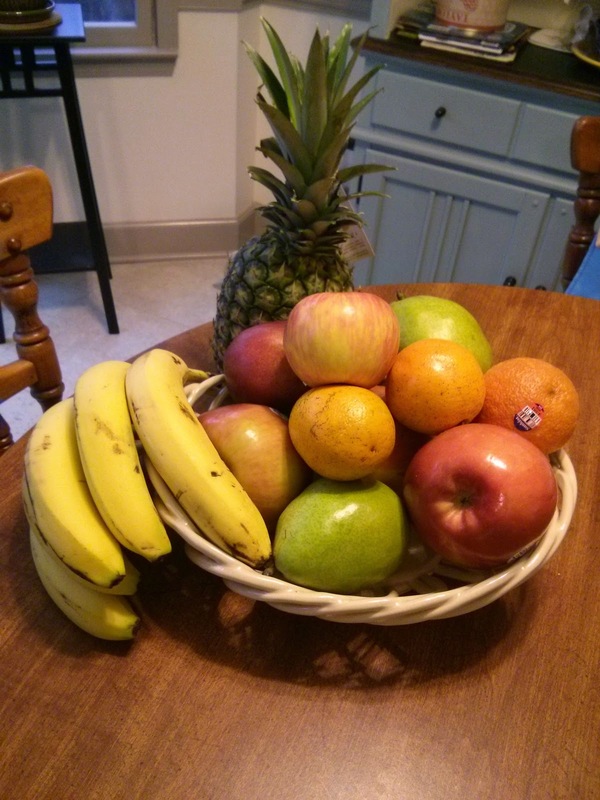 The food challenge this week was to eat local foods. I don't think this was that hard as this is something we already try to do, and we keep plenty of local meats and veggies stocked in our fridge and freezer most of the time. Week 11: Eat at least 1 locally grown or raised food at each meal. This includes, but is not limited to: fruits, vegetables, eggs, grains, nuts, meats, and sweeteners like honey. This plan probably wasn't the healthiest but it was packed with a lot of my favorites and I enjoyed it thoroughly. 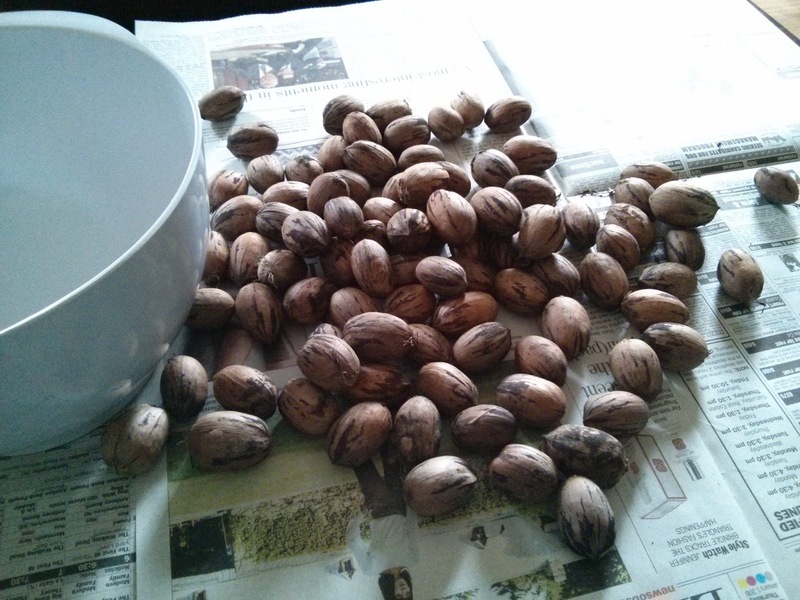 Just sharing some snapshots of a recent kitchen endeavor - shelling pecans and then prepping them for freezing! I think this project stretched out over 5 days. It was very time consuming but so worth it! Although I'm not actually sure how worth it Patrick would say it was. Here's a photo recount and some information about what we did! Right before the holidays my dad shared with us a few bags of pecans. We were very thankful to have these pecans at our disposal. As we all know pecans are expensive because, I imagine, cracking pecans is a daunting task. With that said Patrick may argue after this pecan project that the price is justified. We cracked pecans over the course of three evenings. 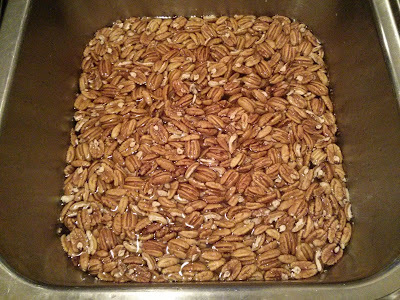 After we cracked the pecans we rinsed the pecans. Granny passed this tip along to us. She recommended it because it removes all the "pecan dust" - small dirt and debris from the shell - off the pecans. After taking the pecans out of the water I was surprised to see how much dirt and debris was left behind! I'm glad we did the rinsing step. Roast pecans on low heat. 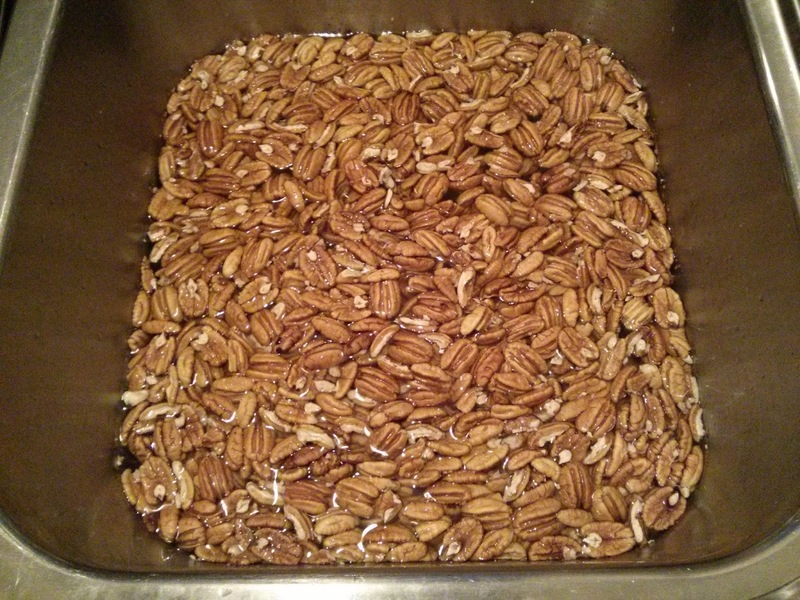 After rinsing the pecans we placed them into a low heat oven (200F) to dry out. Once the pecans have been in the oven for about 30 minutes we turned it off but left them in overnight. Granny also recommended this. Finally the pecans are ready to be frozen or eaten. We bagged three freezer bags of pecans - each with 3 cups in them. With the leftover pecans I put them into a plastic tupperware container for the pantry. What a treat it is to have these pecans ready for us in the freezer! With the ones in the pantry we have already made a pecan pie, added them to salads, and have been snacking on them. Thanks to Granny for her tips on prepping the pecans. Like us, she has been enjoying watching "A Chef's Life" on PBS and recently Vivian featured pecans and recommended this technique. Patrick had a birthday! At the beginning of the month we celebrated it with a low-key dinner at home (on his actual birthday which was midweek) and then hosted a fun Beer & Cheese Tasting party with friends the following weekend. The day before his birthday I went to Guglhupf, his favorite local bakery, and purchased an apple danish, one of his favorite pastries! So he woke up to this sweet surprise and then for dinner I had planned one of his favorite meals, seared tuna with spring rolls and sake. It felt good to be able to celebrate my husband's birthday with all his favorite things! We saute shredded carrots and Brussels sprouts in a little olive oil. Once softened we add freshly grated ginger and soy sauce. Then we roll them in spring roll wrappers. And for this particular evening I had found brown rice spring roll wrappers! And then I surprised him with cupcakes! We have recently had a cupcake bakery open up near our neighborhood (so it's too new to be a favorite yet) and I thought it would be appropriate to get Patrick some cupcakes. I knew we would be making cupcakes for the beer and cheese party and didn't want to make cupcakes right before that. I did, however, try to pick out a favorite flavor! Sometimes it can be hard to predict what flavor he would choose at a cupcake shop but I went with red velvet cake and cookies-n-cream. He said he approved of the picks! On that last point, we've switched blogging platforms, which was not the smoothest process, so some of the imported posts might be a bit rough around the edges. I fixed up the ones I've found so far, but just send us a message or leave a comment if you see anything that looks odd or doesn't work properly. Similarly, if something about the new site rubs you the wrong way, just let me know and I'll see what I can do. I'm sure we'll be making some tweaks of our own over the coming weeks. We hope to make this transition as easy as possible for our reader(s?)! It is with much celebration that we write this post - yesterday you read our six hundredth post on our blog! Many thanks if you are a reader or follower. We have one consistent commenter (thanks Mom) but I know there are more of you out there. Fortunately we're not doing this for the fame or the followers. 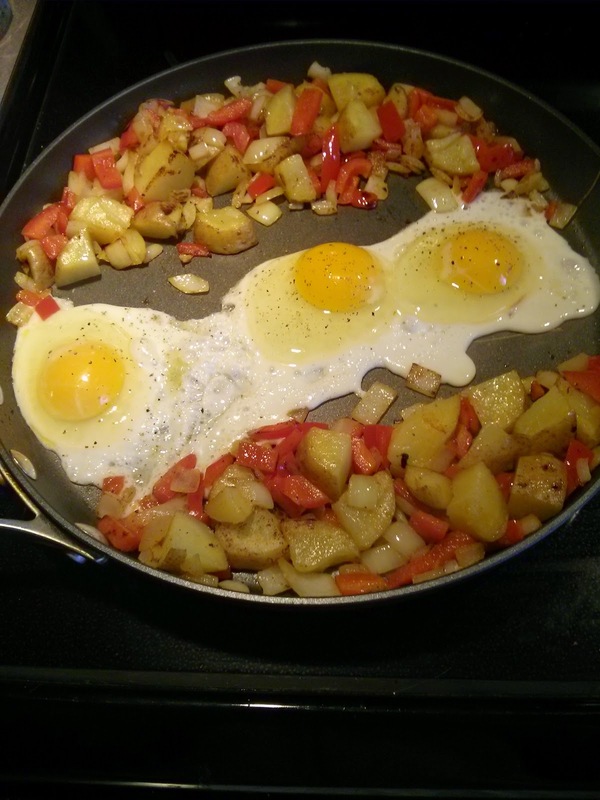 We blog to have an online cookbook. We've realized that so many good things happen in the kitchen and there are lots of happy memories made in that room that the blog has also morphed into a memory album for us. The blog is a great way to keep track of those happy events and memories. And in other personal events we shared when: Patrick proposed in spring 2012, we got married in August 2013, bought a house in spring 2014, and adopted cats in fall 2014. The blog also allows us to connect with whoever chooses to follow us. And I sincerely hope that it encourages you to try to cook one meal in your kitchen that you wouldn't have otherwise. How much cooler is that?! Now that we're settling into our new home we wanted to be able to share more with you and thought theeibls.com would be a better platform. However, keep in mind, that what we do most with our evenings is cook so the majority of the blog will still be recipes! Meal plan Monday will still be happening. 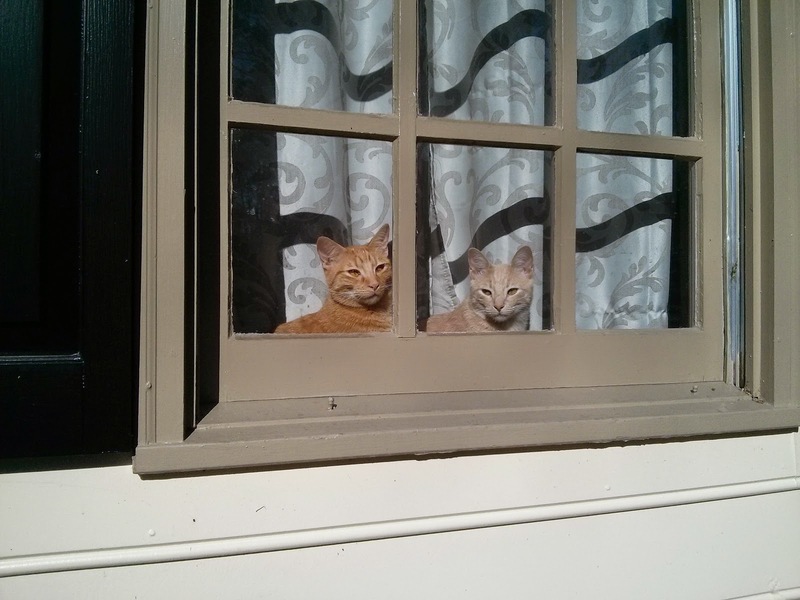 There will just be more cat photos, maybe a few house projects, and general what's happening in our life. Humans ... where are you going?! 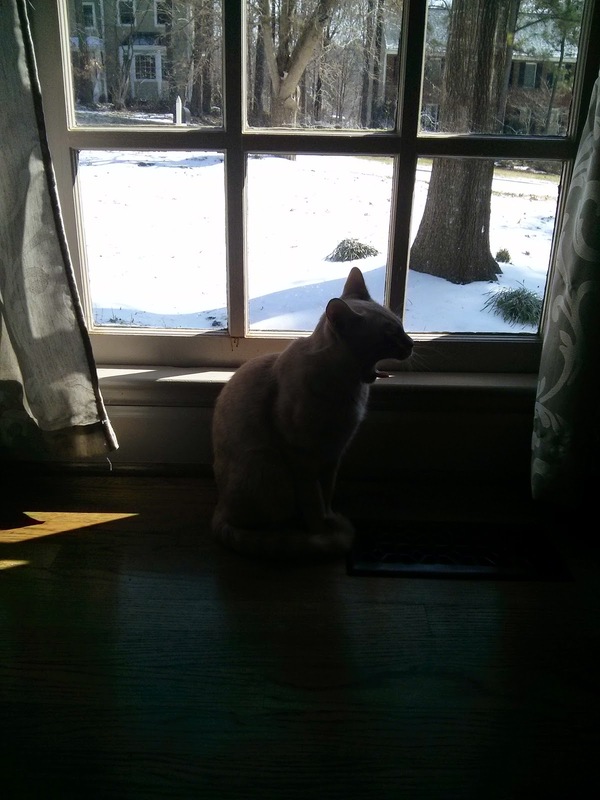 Oh ... on to a new blog. We approve! One of Whitney's birthday requests was that I prepare the meal plan for that week. We had recently purchased the vegetarian edition of William Sonoma's Food Made Fast series, so that provided an easy starting point for finding one of our meals for the week. This particular recipe seemed like a good combination of tasty flavors and a filling meal that can be hard to find with vegetarian dishes without resorting to pasta (which is a favorite of ours, but we have to switch it up sometimes!). Unfortunately it was not pomegranate season at Harris Teeter so I had to buy a thing of pre-separated seeds; we'll have to try it again with fresh ones. The salad turned out great (overcooked rice notwithstanding) and I'm glad to have another good vegetarian recipe in our repertoire. In a large saucepan over medium-high heat, combine the rice, water and the 1/2 tsp. salt. Bring to a boil, reduce the heat to medium-low, cover and simmer until the rice is just tender, about 40 minutes. Drain and place in a bowl. Add the celery, cranberries, walnuts, chopped oranges and orange juice to the rice; and arugula. Add the oil and stir with a fork to combine. Season with salt and pepper. Spoon the salad into a serving bowl. Sprinkle with the pomegranate seeds and serve immediately. We were spoiled with gorgeous weather at the beginning of the week right before the first day of spring. We enjoyed a few meals outside on the deck before the spring chill arrived. My mom visited at the beginning of the week; she helped with a few errands and we enjoyed catching up. We met one of her friends at Zinburger on Monday night and then the rest of the week was normal meal planning! 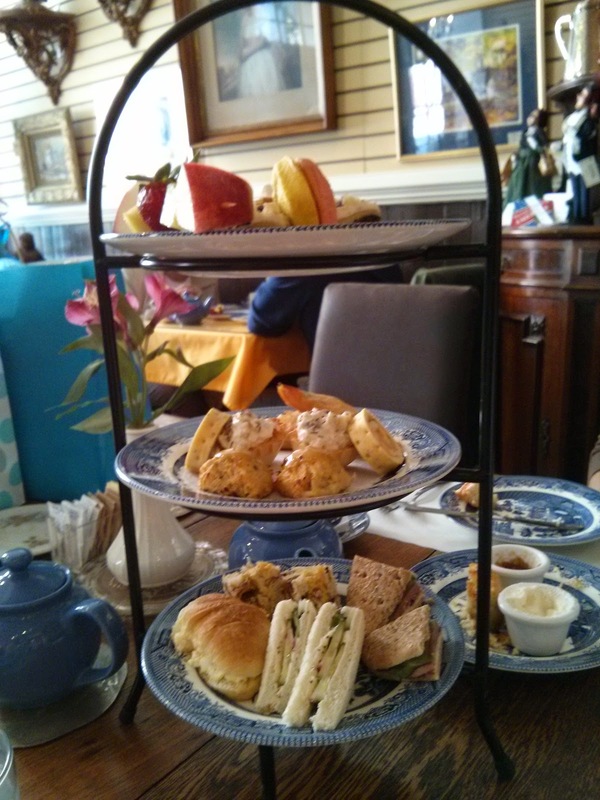 I met some college friends at a tea room over the weekend. We were celebrating the expected arrival of a baby boy in just a few weeks! 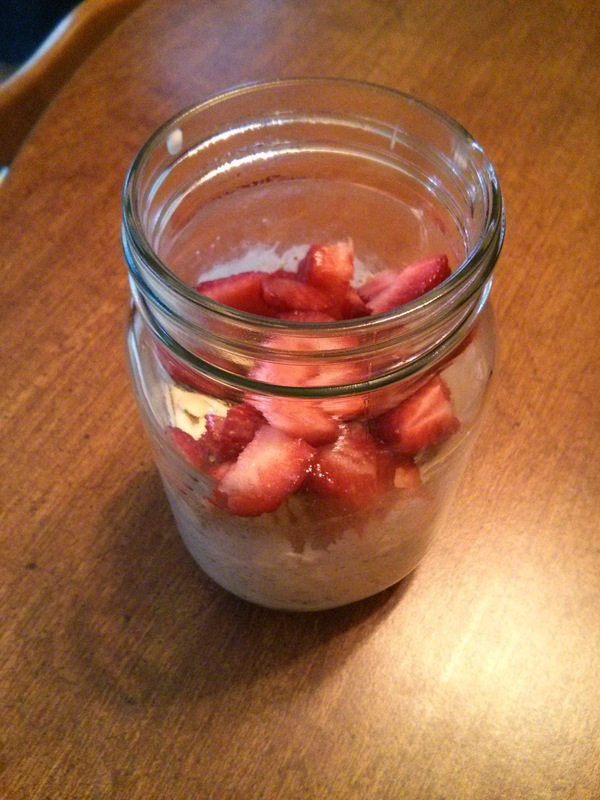 The food challenge this week was no refined or hydrogenated oils. I just made sure not to use any vegetable / canola / corn oil. The cupcakes I made for the St. Patrick's holiday didn't have oil! Week 10: No refined or hydrogenated oils including (but not limited to): vegetable oil, organic vegetable oil, soybean oil, corn oil, canola oil, organic canola oil, margarine, and grape seed oil. I probably should've done a little more research on oils before going into this week's challenge. The information sent out through the challenge said extra virgin olive oil was okay which is what we typically cook with. I'm hoping to finally do that oil research before too long because I think there are better options for us to use with high heat cooking. This is one reason I'm liking the challenge. We don't buy margarine anymore and use these refined / hydrogenated oils sparingly but it is making me more aware that I need to be more mindful of what oils we are using in the kitchen. I found this oil comparison chart particularly interesting. Ever since I made this easy Clam Chowder last year I've loved including clams in the meal plan every now and then. They're not my absolute favorite choice for seafood but their salty goodness of the sea keeps bringing me back to them much to Patrick's dismay. Here's a tip sheet from Choose My Plate.gov with 10 Tips to Help you eat more Seafood. It claims that clams provide healthy omega-3 fatty acids. Some of my other clam research found that clams are also a great source of iron. Another reason why I keep clams in the meal plan rotation is because they're a great pantry option. I can keep a can of clams on the shelf and know they'll be good with potatoes for the chowder or with some pasta. On this particular evening we served with a side salad to make sure we were getting a serving of vegetables! Patrick and I love trying new Asian dishes. This one today is similar to this stir fry we currently make quite a bit. This one had those similarities (like coating the chicken with cornstarch) but reduced the prep time and cooking time by half. It doesn't pack quite the flavor punch the other stir fry does but being able to cut the prep / cooking time in half means I'm willing to sacrifice a wee bit of flavor! And you'll never guess where I found the recipe! In the coupon section of the Sunday paper! I rarely flip through the coupon books because I rarely find a coupon to use. I find that the majority of the coupons are for processed foods and I try to stick with whole foods. And there are certainly times where I see coupons for products we buy but since I'm not a frequent coupon-er I have no system in place to store the coupons so, unfortunately, coupons are just a hassle for me. But every now and then I like to browse the coupon books to see if anything has changed and I'm ready to adopt some coupon-ing. 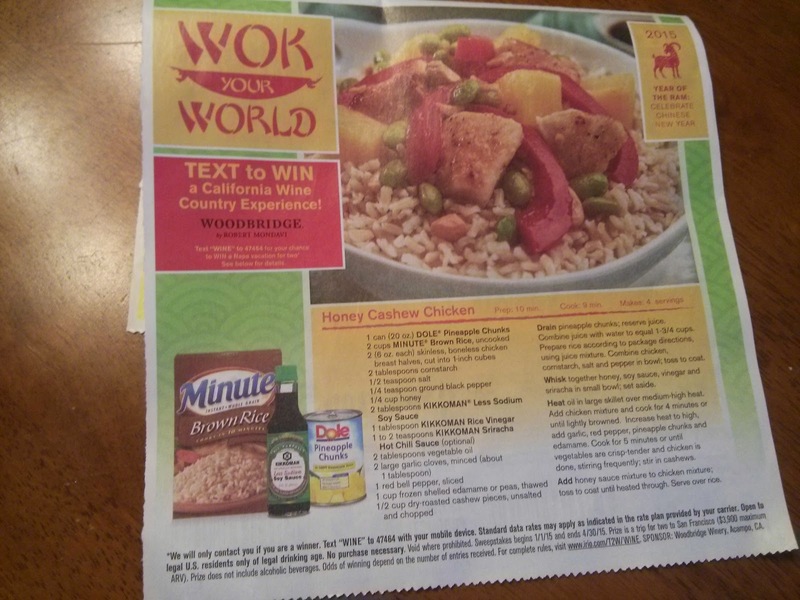 Well on this particular flip through the coupon book there was a "Wok Your World" page with the following recipe and coupons for the canned pineapple and the soy sauce. At first I was a little skeptical the recipe wouldn't be something I would want to try. 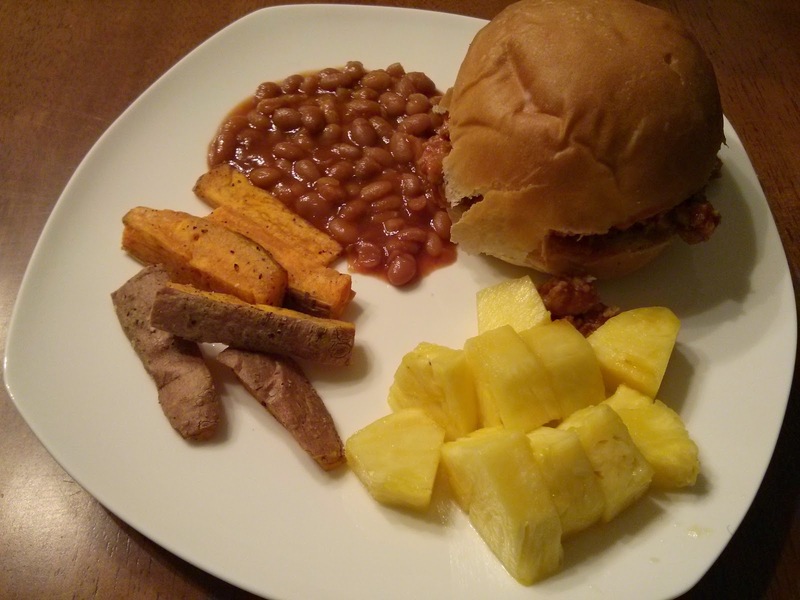 The major offensive ingredient to me was the canned pineapple and I knew I could easily swap that out for fresh pineapple and make a few other substitutions to make it something we would want to try. I'm really glad I flipped through the coupon section that day! This Honey Cashew Chicken will be added to the meal plan rotation. Drain pineapple chunks; reserve juice. Combine juice with water to equal 1-3/4 cups. Prepare rice according to package directions, using juice mixture. [Since we used fresh pineapple we prepared the rice with chicken stock.] Combine chicken, cornstarch, salt and pepper in bowl; toss to coat. Whisk together honey, soy sauce, vinegar, and sriracha in small bowl; set aside. Heat oil in large skillet over medium-high heat. Add chicken mixture and cook for 4 minutes or until lightly browned. Increase heat to high, add garlic, red pepper, pineapple chunks and edamame. Cook for 5 minutes or until vegetables are crisp-tender and chicken is done, stirring frequently; stir in cashews. Add honey sauce mixture to chicken mixture; toss to coat until heated through. Serve over rice. Any coupon-ing tips for me?! This recipe for drop scones was featured in the News & Observer a few months ago. The write-up for it was very interesting and really what piqued my interest in this brunch option. It's said that Queen Elizabeth shared this drop scone - or Scottish pancake - with President Eisenhower. You can read the N&O article here and get all the details. We served the drop scones topped with cream cheese and fresh strawberry jam (per the article's recommendation) alongside fresh pineapple. Stir together eggs, sugar and 3/4 cup milk in a medium bowl until fully combined. Add flour and stir until completely wet. Add remaining 3/4 cup milk, cream of tartar and baking soda. Stir to combine. Melt 2 tablespoons butter and fold that into batter. Heat a large skillet over medium-low heat. Melt 1 tablespoon butter as needed. Spoon about 1/4 cup batter into pan and cook until bubbles appear, about 2 to 3 minutes. Flip, cook until lightly browned, about 1 to 2 minutes. Serve with strawberry jam and English clotted cream or cream cheese. For the strawberry jam I loosely followed this Quick Strawberry Jam by Martha Stewart recipe. Basically I did a rough chop of strawberries, placed them in a small pot to simmer with a little bit of water and some sugar. After the strawberries started to break down I used a potato masher to get them to a jam consistency. The recipe calls for lemon juice but since we were only making what we were putting on the scones (and not storing it) I didn't add in the lemon juice. It was our first brunch outdoors - one of those brief respite mornings in the upper 60s that was the calm before all the snow storms! I'm not sure how pie crust fits into our healthy lifestyle, but whether it's a hand pie, tomato pie, chicken pot pie, an actual dessert pie, or these delicious empanadas, I'm not complaining when it does! I suppose Whitney figures that as long as we make it ourselves, at least we know exactly what's in it (butter/flour/salt). These empanadas have a tasty veggie and cheese filling, and aside from tasting great, they're fun to eat! We had a little difficulty figuring out the balance of filling vs. crust when we were wrapping them up, but they turned out just fine. Offsetting the empanadas are some homemade spanish rice (we made it from a wild rice blend) and a side salad. I think we undercooked the rice a little bit but other than that I found it to be an enjoyable alternative to our typically simple rice preparations. Whitney prepared a helpful printable doc here with the recipes. In large bowl, mix corn [squash/onion], jalapenos, black beans, salsa, cumin, lime juice and cilantro. Set aside. Unroll pie pastry on floured countertop or cutting board. Use a 4 inch wide cup or round cookie cutter to cut circles from the dough. Roll out scrap pieces of dough for more circles. Place bean mixture and a pinch of cheese on each circle. Fold over and use a fork to press down and seal edges. Optional Step: Mix one egg white and one small packet Sazon Goya found in the Hispanic food aisle. It is a very inexpensive mix of salt, cilantro, garlic, salt, cumin and Annatto (achiote) seeds. I brushed this on before baking to achieve a bright gold color and to add extra flavor. Lay each empanada on a parchment paper lined baking sheet and bake in a 450 degree oven for about 12 minutes, until browned. Serve with remaining corn and black bean salsa. Bring to a boil; reduce heat to low. Cover and simmer 30 minutes or until rice is done. Dupree can't believe how good these empanadas are! Nacho doesn't care about Mexican night unless tortilla chips are involved. Loving this warm weather - finally seems like spring is letting us know it's on the way! Patrick and I worked a bit in the yard over the weekend. We've got grand plans of a yard make-over complete with dry stream bed, a raised garden bed for vegetables, starting a composting pile, and beautifying the back deck! The goals may be a bit lofty so we'll see where we end up. Plans for the past week were always a bit in the air so the meal plan would get planned a few days at a time and some nights were changed around. Our food challenge was a bit more challenging this week. 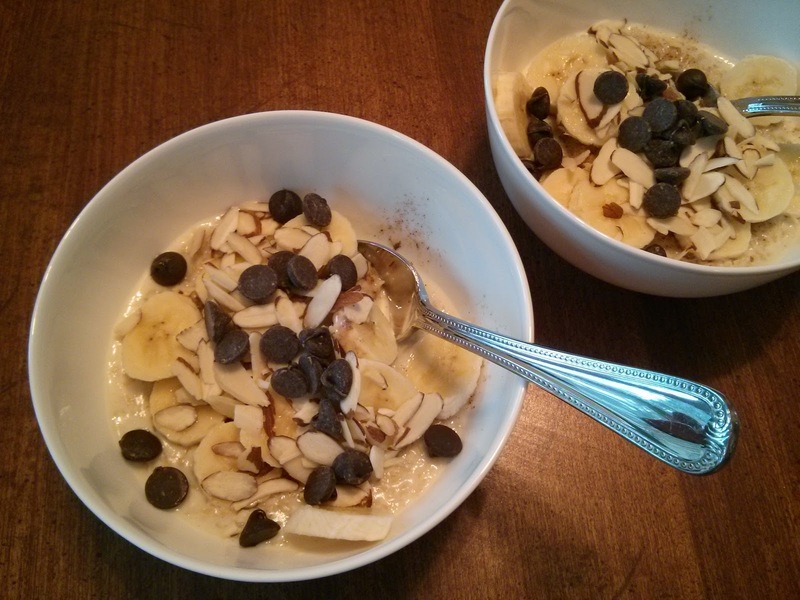 It didn't alter the meal planning so much but more inconvenienced our snacking and breakfast options. Week 9: No refined or artificial sweeteners including (but not limited to): white sugar, brown sugar, raw sugar, sucanat, splenda, stevia, agave, corn syrup, high-fructose corn syrup, brown rice syrup, and cane juice. 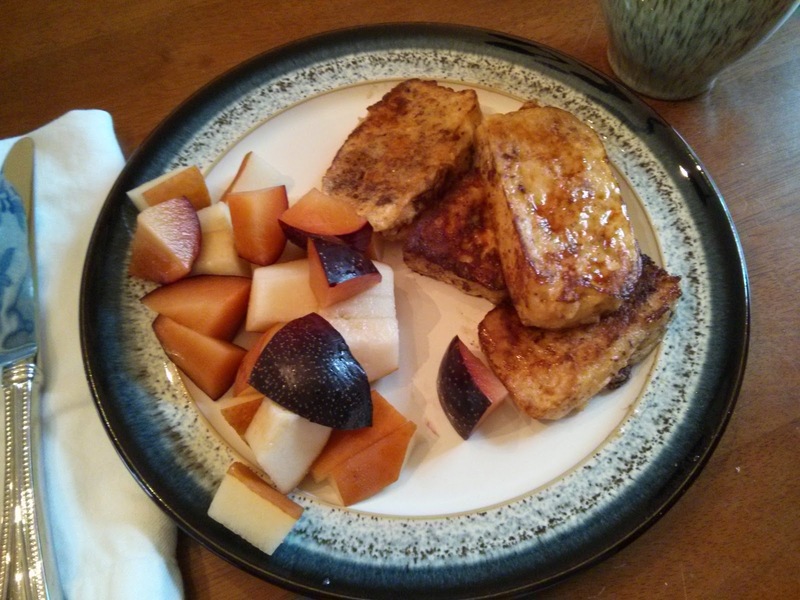 Foods and beverages can only be sweetened with a moderate amount of honey or maple syrup. We're well into our challenge now and they're breaking out the big guns - sugar. Sugar is a big media buzzword these days. And rightly so since sugar has become such a big industry. It's almost everywhere you look and, in my opinion, that's what makes it so timely in any sort of food challenge you see. I mentioned that this was challenging for us. To be successful I would have needed to go through our pantry and refrigerator before the challenge started and flagged everything with a post-it that said "sugar" and avoided those things throughout the week. Patrick started out his Monday with an English muffin topped with peanut butter and jelly. Then we both had an afternoon snack of leftover birthday party cupcakes. I'm not even sure what strike three was that day but I'm sure there was one. Some days were better than others and there were times we didn't eat something because it had sugar. I did some light researching just now to share with you some sugar insight. In this public news release the World Health Organization "recommends adults and children reduce their daily intake of free sugars to less than 10% of their total energy intake. A further reduction to below 5% or roughly 25 grams (6 teaspoons) per day would provide additional health benefits." Much of the sugars consumed today are “hidden” in processed foods that are not usually seen as sweets. For example, 1 tablespoon of ketchup contains around 4 grams (around 1 teaspoon) of free sugars. A single can of sugar-sweetened soda contains up to 40 grams (around 10 teaspoons) of free sugars." Looking back at this past week I see that eliminating sugars isn't a top priority for us. I wholeheartedly believe in everything in moderation. However simply by adding more nutritious options to our diet we will be eliminating the processed foods. So my takeaway from week 1 (eat two fruits and vegetables at every meal) is much stronger than this sugar challenge. Back during our food challenge we were tasked with trying two new whole foods to incorporate into our weekly meal plan. One of those foods was jicama! The meal plan post for that week has a bit of information on jicama if you'd like to know more about it. Jicama is about the size of a softball and can be eaten raw. Patrick and I taste tested it before making our salad. We agreed that it tastes like an apple-potato hybrid vegetable. To prepare the jicama I simply sliced off the outer peel and then chopped it into small matchsticks. I think the jicama lends itself to being more of a summer food. I saw a few recipes pairing it with watermelon so I look forward to trying it again! For this particular evening we made an orange avocado jicama salad. Using a sharp knife, peel the oranges, removing all of the bitter white pith. Working over a small bowl, cut in between the membranes to release the sections. Squeeze the membranes over a bowl to extract the juice. Whisk in the lime juice, vinegar, oil and cayenne; season with salt and pepper. Add the jicama and let stand for 15 minutes. Fold in the orange sections, avocado, feta and cilantro; serve. We layered the salad (versus folding together) and then based the salad with kale. We served the jicama salad with roasted salmon and cauliflower. Patrick and Dupree - both looking so handsome! It was my birthday! Woo birthday! You know what happened on my birthday? It snowed. I invited friends over for a casual gathering on my birthday so I could share cake. I didn't want anything too fancy and that seemed like the perfect thing to do. But as you can imagine the wintry storm froze over the roads and no one could come! That didn't stop me from making a cake though! The neighbors were gracious enough to walk over and help me eat birthday cake... then I sent the rest with Patrick to work once the roads cleared. Well I was having a little trouble coming to terms with making a boxed cake mix for my birthday for two main reasons. One - I enjoy cooking and baking from scratch and that's how I envisioned my birthday. Just me in the kitchen making an exciting birthday cake and a boxed cake mix wouldn't be too exciting. And two - I'm doing a food challenge and being more health / nutrition conscious these days and a boxed cake mix isn't inline with those goals. What's a birthday girl to do?! Google around for homemade funfetti cake! I found a few different options and settled on one from Sally's Baking Addiction blog. Click here for the google document I made for it. To make the frosting, beat softened butter on medium speed with an electric or stand mixer. Beat for 3 minutes until smooth and creamy. Add powdered sugar, cream, and vanilla extract with the mixer running. Increase to high speed and beat for 3 minutes. Add more powdered sugar if frosting is too thin or more cream if too thick; add 1/4 teaspoon if frosting is too sweet. 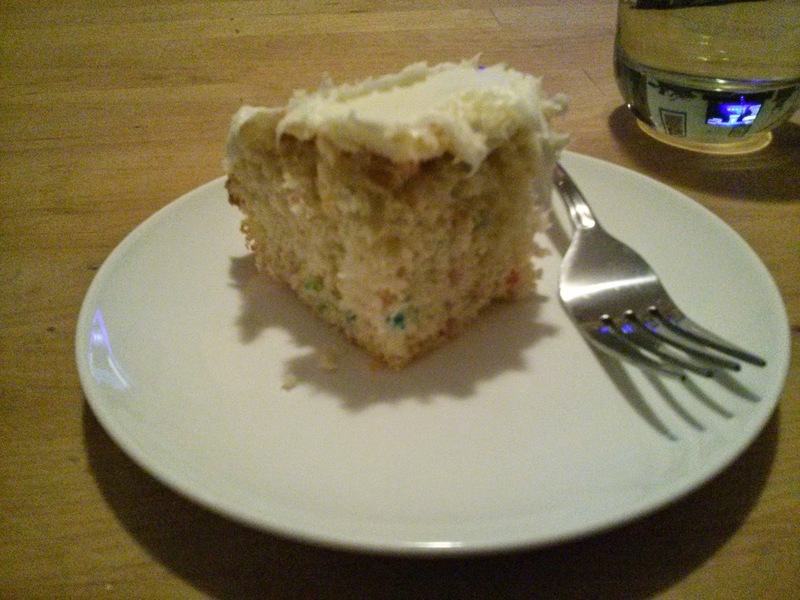 Frost cooled cake as desired and top with sprinkles. There may be leftover frosting depending how much you wish to use. Other notes: for a layer cake: (1) Bake the cake as indicated and slice the cake horizontally to create two layers. Double the frosting if desired. (2) Double the cake recipe and bake in two separate 9-inch cake pans. Fill the pans only 1/2 way full and use any extra batter to make cupcakes. Double the frosting recipe as well. For standard cupcakes: bake for 20 minutes or 24+ mini cupcakes: bake for just 8-9 minutes. For a 9x13 pan: double the recipe, fill pan halfway with batter, use any extra batter to make a few cupcakes. This size cake will take around 30-35 minutes. This was a really great birthday! 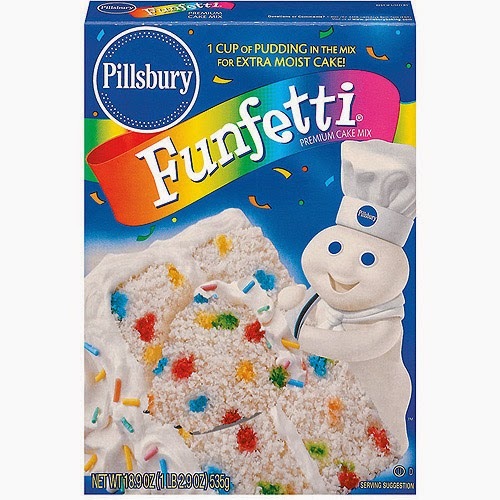 Unfortunately it wasn't the imitation funfetti cake I was hoping it would be. So here's to next year and trying again. On a happy note, though, the following week we went to DC to celebrate a friend's baby shower and wouldn't you know we got snowed out. But we had planned to stay with one of my college friends so kept our plans. Well she had made me a true funfetti cake in honor of my birthday! It was glorious!